(Nanowerk Spotlight) Most of the nanotoxicology research currently undertaken deals with the potential risk aspects that various nanomaterials might pose for the human body. So far, the mechanisms of nanoparticle phytotoxicity – the ability to cause injury to plants – remain largely unknown and little information on the potential uptake of nanoparticles by plants and their subsequent fate within the food chain is available. Research in this area (see our Spotlight: "Nanoparticle uptake by plants") is fairly scant, and among the few studies available, none have used major food crops or carbon nanoparticles. The interaction between nanoparticles and plants currently is poorly understood. Unlike mammalian species, plants have thick and porous cell walls and a vascular system for water and nutrients uptake. Plants in natural environment can also conduct photosynthesis. How nanoparticle uptake and their accumulation may impact on plant structure and their biological and biochemical processes remains a question. The few studies available in this field are probably only touching the tip of the iceberg. A team of scientists at Clemson University has undertaken an effort to shed light on the impact of nanomaterials on high plants, filling a significant knowledge gap in the current literature. They showed how nanoparticles above certain concentrations could clog the vascular systems of plants. They also showed how these nanoparticles above certain concentrations could impact on seed setting. An interesting aspect of this work is that, besides the potential risk aspects of these findings, researchers might also utilize them to deliberately inhibit the growth of certain type of undesirable plants like weeds. "Apart from the toxicological aspects we also wanted to illustrate the new science in this area of research by introducing some biophysical approaches to the discussion," Pu Chun Ke tells Nanowerk. "In our recent work, we used natural organic matter (NOM), the substance abundant in the natural environment, to suspend fullerene nanoparticles. We used rice plants, the most important food crop species, as a model system. We showed the biodistribution of carbon-based nanoparticles in plants using imaging and FTIR spectroscopy, and for the first time we discovered the generational transmission of nanoparticles. All these are major advances in the field." Ke, an assistant professor (associate professor from May 1) who leads the Single-Molecule Biophysics and Polymer Physics Laboratory, together with professors Hong Luo and Apparao Rao, and members of their groups, have characterized the dynamic uptake, compartment distribution, and transformation of fullerene C70 in rice plants and have detected the transmission of C70 to the progeny through seeds. The team published their findings in the February 20, 2009 online edition of Small ("Uptake, Translocation, and Transmission of Carbon Nanomaterials in Rice Plants"). For their experiments, the Clemson scientists incubated newly harvested rice seeds in Petri dishes that contained 15mL of different concentrations of C70–NOM and MWNT–NOM in rice germination buffer. After germination at 25±1°C for 2 weeks the seedlings were transplanted to soil in big pots and grown in a green house to maturity without addition of nanoparticles. To investigate generational transmission of nanomaterials, mature seeds from the control plants and C70-treated plants were harvested 6 months after germination, and a number of seeds of similar size for each plant were chosen to again be planted in a Petri dish filled with rice germination buffer and kept again at 25±1°C for another 2 weeks. 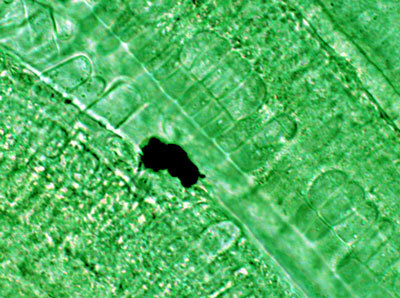 This time, these germinated plants were allowed to grow without the addition of nanomaterials. Examining the tissue of their rice plants at various development stages, the researchers frequently found black aggregates in the seeds and roots, and less frequently in stems and leaves, indicating that the sequence of nanoparticle uptake was from the plant seeds and roots to the stems and leaves. "The appearance of black aggregates mostly in and near the stem’s vascular system suggests the transport of C70 occurred simultaneously with the uptake of water and nutrients in the xylem," says Ke. "Remarkably, black aggregates were also spotted in the leaf tissues of the second-generation plants, though much less frequently." According to the Clemson team, the accumulation and transformation of nanoparticles in plant tissues and cells suggests a plausible mechanism for nanoparticle uptake: a dynamic competition between nanotransport driven by water and nanoparticle convections and the physical hindrances of plant tissues and nanoparticle aggregation. Ke explains that individual C70 nanoparticles may enter plant roots through osmotic pressure, capillary forces, pores on cell walls and intercellular plasmadesmata or via the highly regulated symplastic route. "Once in the plant roots and stems, individual C70 nanoparticles may share the vascular system with water and nutrients and may be transported via transpiration, the evaporation of water from the plant leaves" he says. "Individual C70 nanoparticles may also form aggregates or even clog the vascular system due to hydrophobic interaction, or may leak into nearby tissues and cells via these mechanisms." "The integration of nanoparticles by plant species may result from the nanoparticles' small dimension and self-assembly and from the nanoparticle interactions with plant organelles and the natural organic matter," explains Ke. "The potential impacts of these processes on both food safety and the environment are important subjects to understand. Future research needs to address questions such as to what extent molecular and genetic mechanisms may mediate plant responses to nanoparticle exposure and, furthermore, how to control such responses for mitigating the adverse effects of nanomaterials on plant development." This field of research is quickly becoming a priority area for federal funding agencies, fueled by a strong public interest in and concerns of nanotechnology. The major challenge for this area of research is its vast complexity, which can only be addressed adequately by breaking the barriers of traditional disciplines. As a testament to this statement, the Clemson team consisted of three groups in biophysics, materials synthesis, and plant biology.